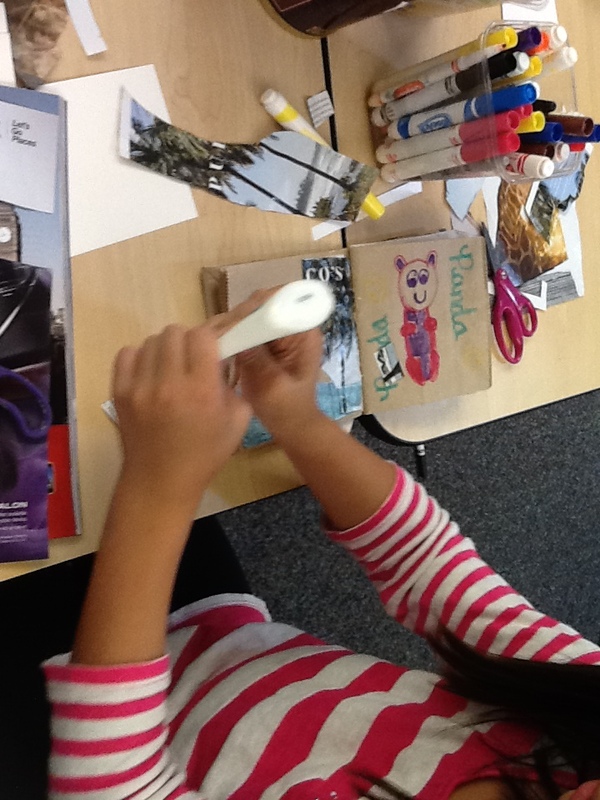 My students LOVE making books. This paper bag book is pretty simple to make with easy to find materials. It can elaborate or simple. To begin, you need paper lunch bags. A package of 100 bags is about $4 and each student uses 3-4. If the students are going to paint the pages, it is easiest to do that before the book is assembled but can be done either before or after. Place the paper bags in a stack alternating the bottom flaps to reduce bulk. 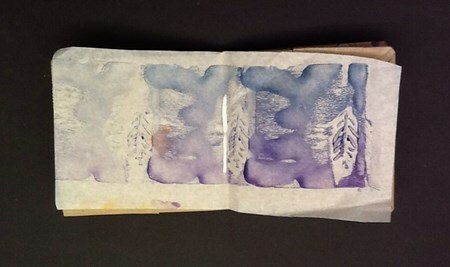 You may also choose to put decorative papers between the pages or in the center, if you choose. You can staple them on one edge, or in the center or stitch them again down the center or on one edge. Sewing or stapling will depend on the age and ability of your students. For this small group of 4th graders, they stitched them using a simple three hole binding stitch and some twine I had in the art room. We punched the holes with a nail before sewing. 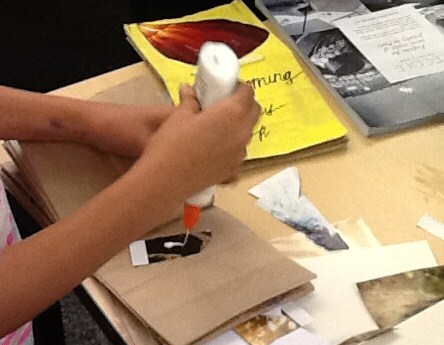 Bags may be painted, collage, cut and folded to achieve different looks. For this lesson, we used pre-painted bags for the cover. 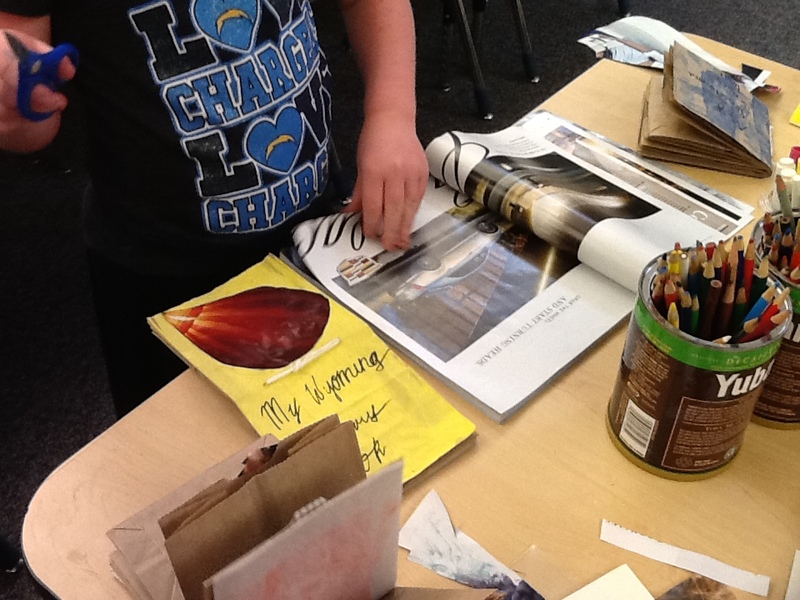 Students assembled the book then added collage elements from magazines to the inside. They wanted to fill the books with summer vacation memories. I recently was a substitute in a friend’s combo class and she asked me to do something for Father’s Day with her students. One of the preschool teachers at my school does Mother’s Day portraits with her students every year and they are adorable. 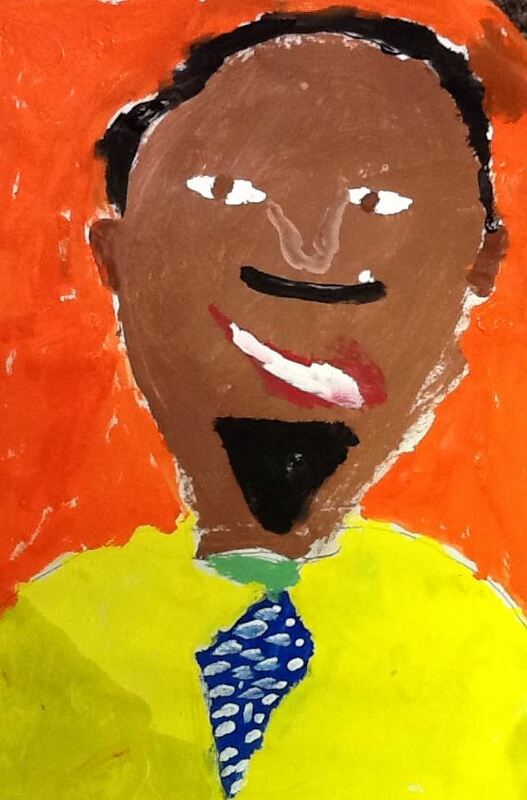 For this group of very capable second and third graders, I chose to have them paint a portrait of their father and write a cinquain poem. Because I had an entire day to work with the students, we started by drawing a light pencil sketch of the head, neck and shoulder and painting the skin color in the morning. By afternoon, we had completed our daily work, the paint was dry and students were able to add all of the details. I did demo how to make different kinds of eyes, noses, ears and hair. My hope was that the hair would look a little more realistic than just painting a strip of color across the top of the head. I think they all did a great job of making them their own. I hope the dads are pleased with their portraits. I know the students had a great time painting them. Wouldn’t it be fun to have a picture of the dads next to their portraits?